AND PAINT YOUR OWN POTTERY IS ONE! I met Elissa a little under a year ago when I worked on a new television series for Investigation Discovery. After a few weeks there, Elissa had taken me under her wing. 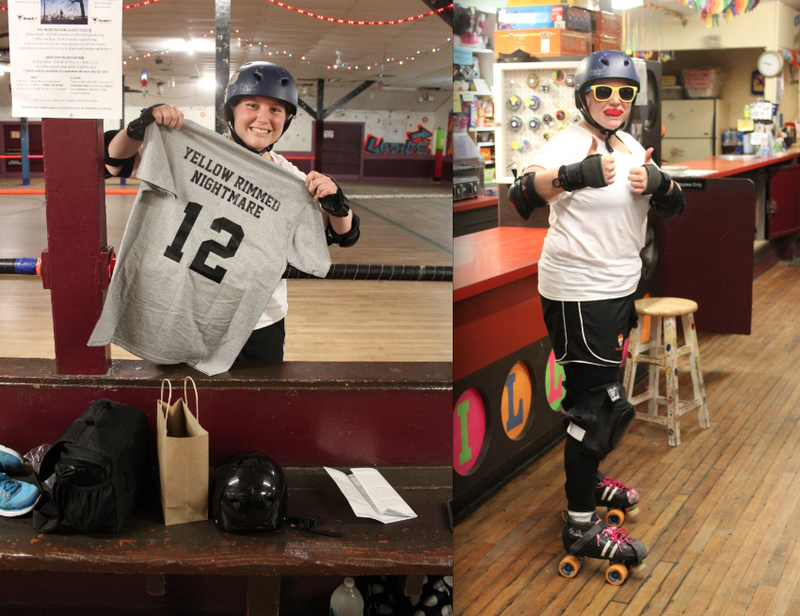 We tagged team stories for our new show, compiled research packets and booked interview guests. Around one month in, Elissa started to check out The Hobby Hoarder project. Then one day she told me she wanted to do a hobby–but a creative one, an artsy one, and so I promised her we could. Four months later, it was my last day on the show–and we hadn’t yet hobbied! Upset with myself for not scheduling a hobby together before I left on my road trip, I promised her that when I got back–we could do that creative hobby she wanted to do. The following day, I Googled creative hobbies around the city, and found “Paint Your Own Pottery.” I sent Elissa links and dates we could do it. Finally, we were ready to do the hobby together that we planned so long ago. I crossed my fingers that nothing would interfere with our paint your own pottery outing, and except for a small hiccup in having to change the day to one day earlier–nothing interfered at all. Phew. So just over a week ago, Elissa and I headed to the Painted Pot in Park Slope, Brooklyn for our adventure. Upon arriving at the store, we were immediately floored with all the options of what we could paint. “Lanterns and kettles, and plates, OH MY,” I exclaimed in my head. There were also mugs and cups and vases as well as bowls and platters. 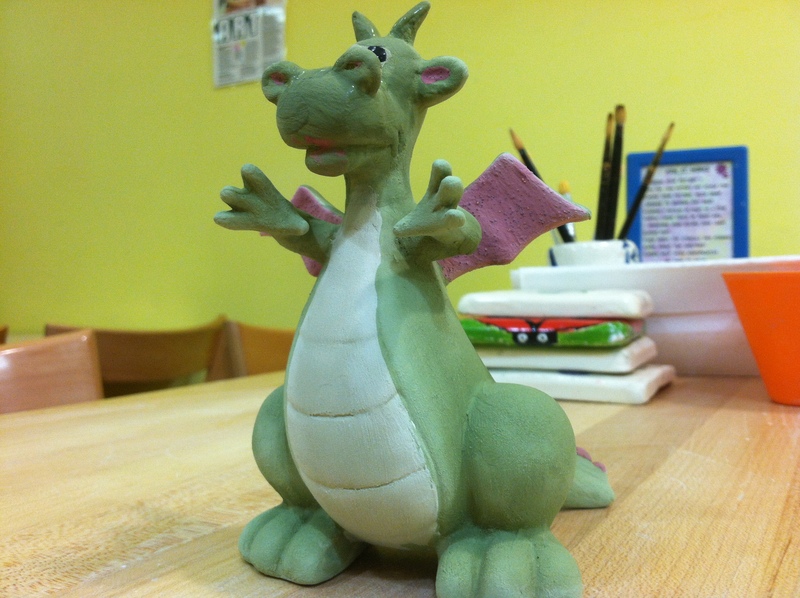 But that wasn’t it–there were piggy banks–and dragons and elephants–and wizards! The choices of what to paint were endless. We were in a pottery paradise. As I searched for the perfect piece of pottery to paint, I imagined directing a spoof of the film “Night at the Museum” called “Night at the Painted Pot,” where all the clay creatures come to life. (A girl can dream). As Elissa looked through her options, I could see her getting more and more excited. “Should I do this one? Or this one?” And then she saw it–the dragon. 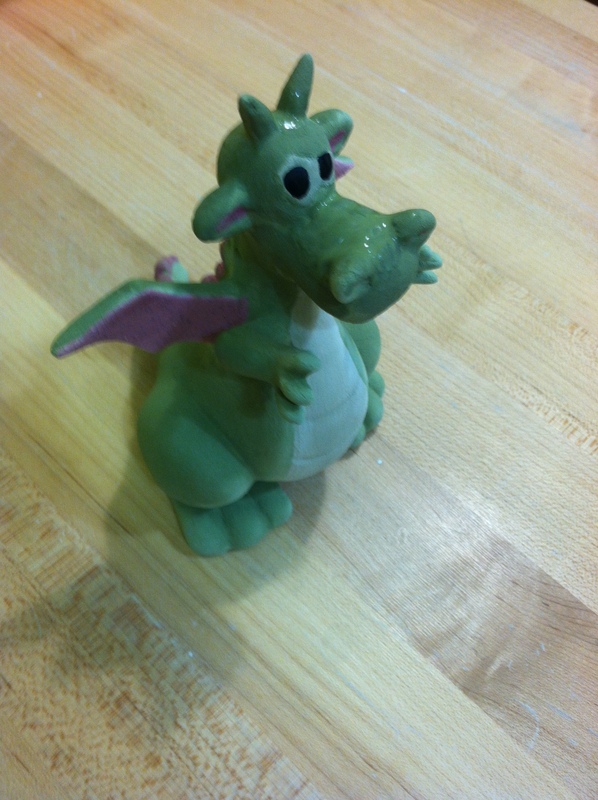 “oooh, I could paint this little guy to look like the Game of Thrones Dragon” and before I knew it, she was making her pottery purchase and picking out all the colors she would need. Then it was my turn. Stuck between a simple plate and a little animal friend–I splurged. 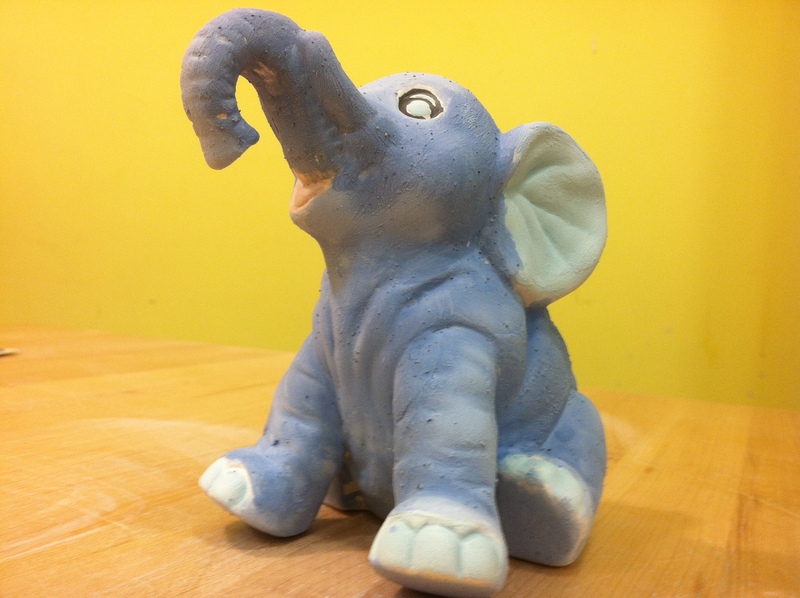 I bought the plate and a little tiny elephant, picked out my colors, and quickly got to work. We only had an hour and a half of painting time before the store closed. As we painted away, I watched Elissa carefully make sure to touch up all the white spots. I could tell that she was really interested in what she was doing–and like my friends when we went skydiving this past week–it ignited even more excitement in me. Before we knew it, an hour and a half had passed–and we were doing the final touch ups on our pottery. 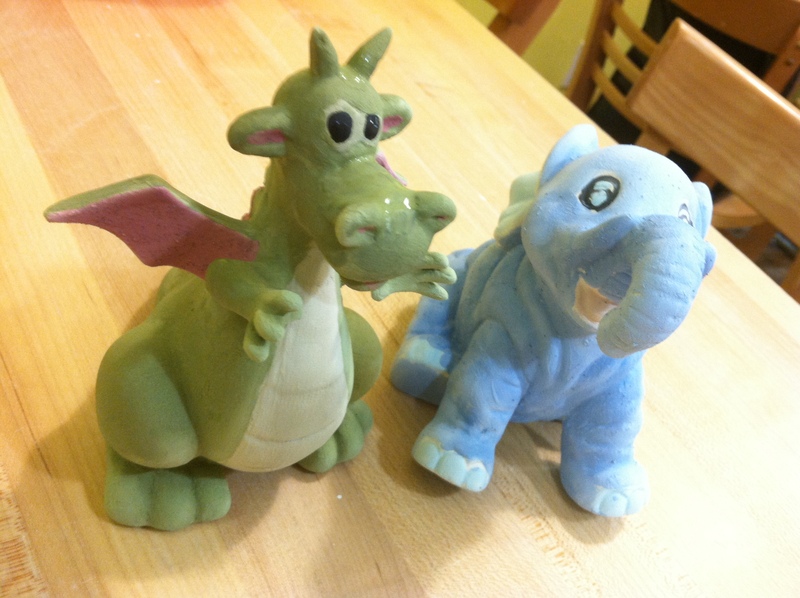 Elissa’s dragon was a brilliant green and dark reddish/purple–while my elephant was a mix of baby and sky blue. 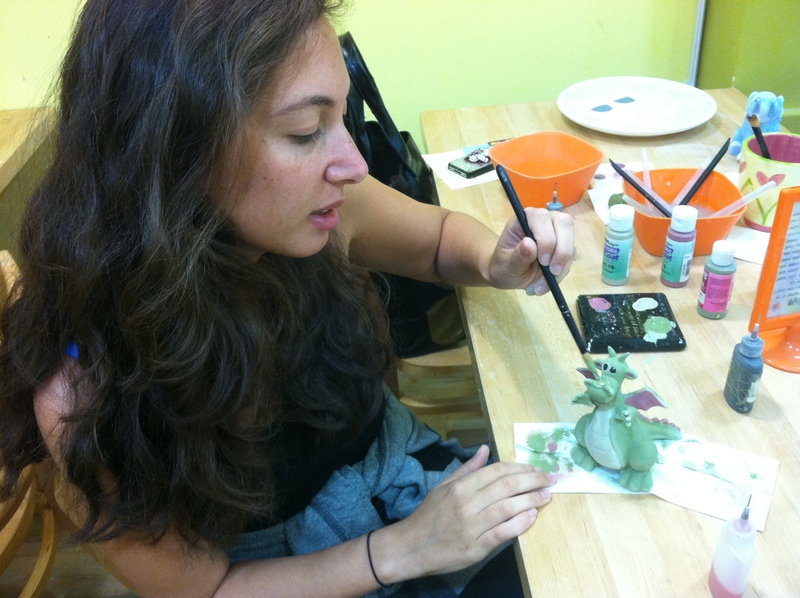 I’ll be honest–my elephant could stand to see a better paint job–but Elissa’s dragon came out–preeeeetty stellar if I do say so. The woman came by and told us to just leave our pottery on the table–that she would put it in the kiln over the next week and we could pick it up after 7 days. Before leaving, I spontaneously started an impromptu photo shoot with our new clay friends. Sad to part with our animals (and my plate), we bid the tiny little lawn gnomes farewell and made our way for the door. Distracted, I began sending Elissa all the shots I had just taken of our statue pottery pieces. As the photos began to pop up on her iPhone, our walk slowed to a crawl. “They are so cute…They are the best…” Then she began sending the photos to friends to share what she had done–and how excited she was about what she had done. And that’s when I tried to rush her–before fairly being reprimanded. Some people have said that it seems like the project is about being a daredevil. But the truth is–the project is about trying ANYTHING and everything. LIFE is about having an open mind to anything you have the opportunity to try and a willingness to learn. It’s about understanding that even what seems like the most basic of activities/events/hobbies can offer some of the biggest life lessons. This year I’ve learned that, whether you are jumping out of an airplane, piloting an airplane, playing chess in the park with a stranger, building a birdhouse with your mom, or getting crafty with a friend, there will always be a takeaway. And there will ALWAYS be something to get excited about–whether it’s before, during, or after. Paint your own pottery may not be skydiving–or hang gliding–or something that seems “adrenaline related,” but I can tell you that going to paint your own pottery–and trying it with someone else who also never had tried paint your own pottery before–was extremely eye opening. I had forgotten to take in the moment–to really appreciate what had just happened. Because hobbies have become somewhat of a habit (a healthy habit) for me, it’s easy for me to go from “hobby hoarder” mode back to “okay, get home, organize for tomorrow, and sleep” mode. But my outing with Elissa was a good reminder to embrace each and every minute leading up to WHATEVER we are doing, during whatever we are doing, and even the moments after we’ve completed what we are doing. Too often we rush to move on to the next thing–to get things done for whatever we’ve got going on for the next day–and to plan out our next event– but that’s not fair to the present moment–and it’s not fair to ourselves. Here’s to trying new things–and continuing to get excited about them. AND here’s to trying new things with good people–and watching them get excited too. Posted in Do It Yourself and tagged arts and crafts, ben stiller, brooklyn, clay, crafty, Dragon, Elephant, friends, Game of Thrones, Hobbies, Hobby hoarding, Libby Segal, Life lessons, new york, night at the museum, Paint your own pottery, painted pot, park slope, plans, plates, pottery, the hobby hoarder. Bookmark the permalink. It’s midnight. I’m wide-eyed and my mind is racing. “Tomorrow,” I think. “Tomorrow I am skydiving again.” My mind continues, “Do I really want to skydive tomorrow?” “I got sick the last time I went skydiving, and that wasn’t so pretty, but I still had an amazing time, and well tomorrow I’m sure…I’m sure I’ll still have an amazing time…” I hear noises from another room of the house I am staying at in Rhode Island. “We’re going skydiving tomorrow!!! !” I hear my friend Lauren shout. Then tap, tap, tap. She comes running out of her room and pushes my door. “Libby! We are going skydiving tomorrow.” I hear her giggle again and tap, tap, tap, back to her room. I smile. I swing my legs out of the bed and I walk over to the room Lauren and her friend Kat are staying in: “Getting excited I ask,” with a grin on my face. They both nod happily, and then begin to ask me questions about my first experience. I tell them everything, from the preparation, to the boarding the plane, to the jump. I tell them we won’t die (hehe) and that it will be a lot of fun, that they are doing something brave and awesome and amazing. I watch them get excited all over again, and then I excuse myself to go to sleep. As I lie back down, I can hear them still chatting–their voices an octave higher than they usually are. I wonder if they’ll sleep at all, but their excitement calms me. The truth is that I wasn’t sure I wanted to skydive so soon after my first experience last year. I knew I wanted to try it again, but I wasn’t positive this was the right time. However, a new friend of mine, Danny had expressed interest in going on an adventure so after deciding against a bungee jump trip to Canada, I told him we could go skydiving. 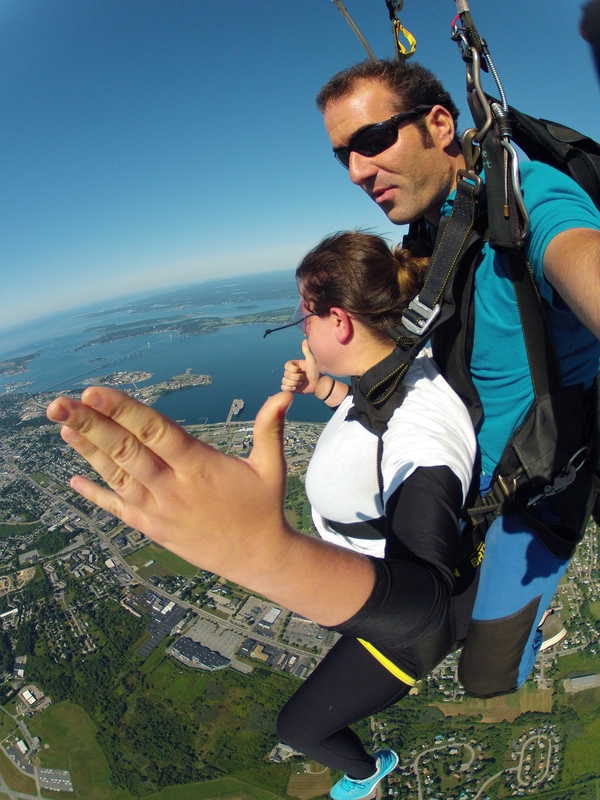 A few other friends of mine were also interested in joining–and they were located in Rhode Island, so I made us all a reservation up at Skydive Newport. When I went to meet Danny, I was nervous about the weekend. 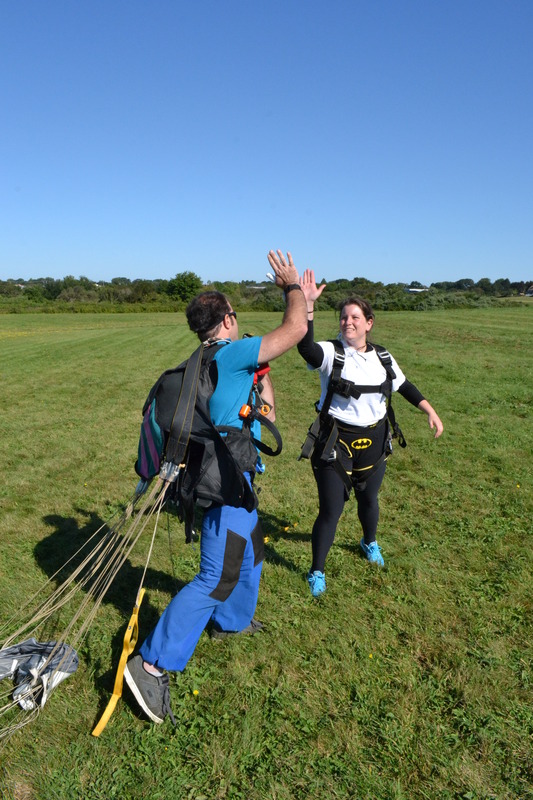 I didn’t know Danny all that well and if he wasn’t super excited–I knew it would be difficult to get through another skydive, since it hadn’t been my top priority. Safe to say–Danny was super excited, and the moment we saw each other in Penn Station, I felt waves of positive energy. “This is going to work out just fine,” I thought to myself. It’s now 1:00am and I am drifting in and out of sleep. I can hear the girls still chit chatting away about the jump in the morning. Danny is asleep downstairs on a couch. But I can feel the energy still buzzing around me. 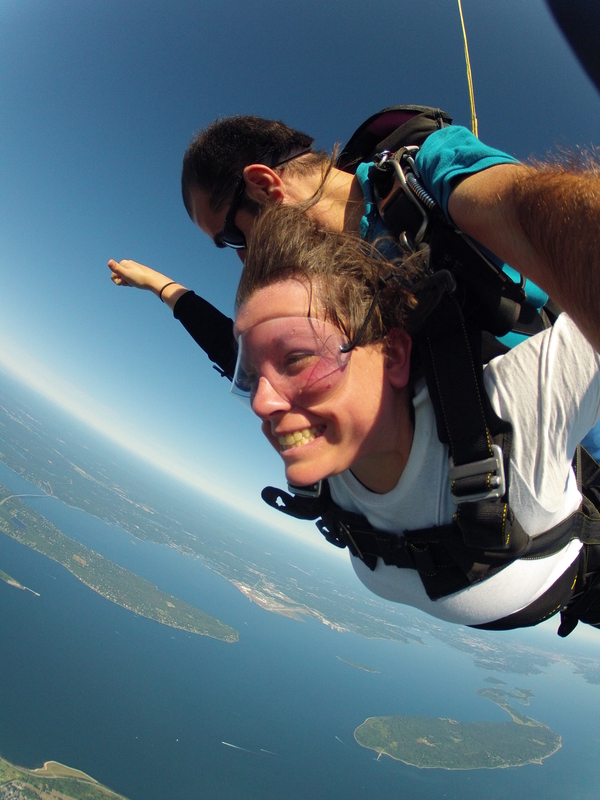 And even if skydiving wasn’t exactly my first choice for a hobby to repeat right away, I am now suddenly overwhelmed with excitement myself–not for me jumping, but for my friends who have never jumped before. THIS is what I love about the hobby hoarder project–going on adventures with others, listening to their excitement, and having the opportunity to see others be completely open to trying something new and taking risks and challenging themselves. “Tomorrow is going to be awesome,” I tell myself as I fade into a deep sleep. When we wake up in the morning, we’ve got an hour drive to Newport. As we drive, Danny turns to me, “I’m so excited. I just want to jump now.” I smile. Again, THIS is what excites me about hobby hoarding. 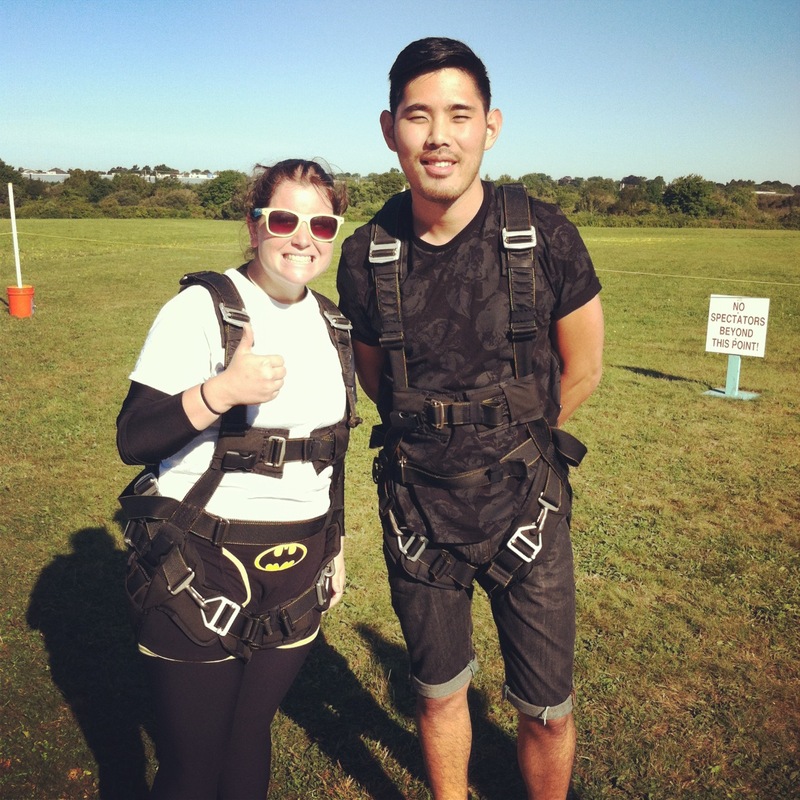 We arrive at Skydive Newport, sign away our lives, empty out our wallets, watch a safety video and then head outside to take our turns jumping out of an airplane. Lauren and Kat go first. They’ve opted to wear the jump suits and are hopping up and down with joy. 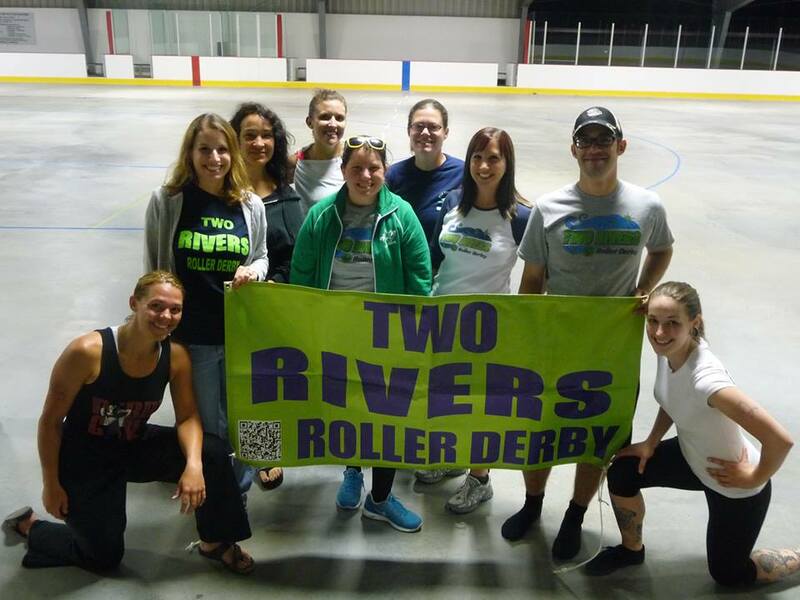 Not before long, they disappear onto an airplane with their tandem instructors. A group of us watches as the plane takes off and they disappear into the higher altitudes of the sky–the buzzing engine allows us to follow where they are. Ten minutes pass and we watch as two specks fall through the sky. Less than a minute later we see the shoots pulled one each of the jumpers. “Ah I just want to jump now,” I proclaim, almost surprised to hear it come out of my mouth. Time slows down for us in the spectator booth as Lauren and Kat float to the ground. I cross my fingers hoping they loved it–hoping no one got sick the way that I did the first time–and hoping the first things out of their mouth will be something like “That was amazing,” or “I just want to go again right now.” They start briskly walking over to us and I can very clearly make out giant smiles on their faces. Lauren runs over to her Dad and gives him a hug yelling how much fun it was. THen she comes over to me and gives me a hug, thanking me for planning the trip–exclaiming how much of a high she is now on. Kat does the same. Danny and I are next. 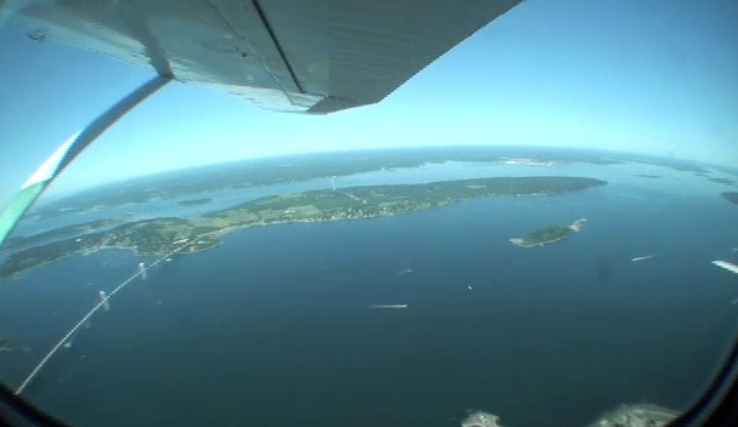 We follow our tandem instructors into a small five person airplane. 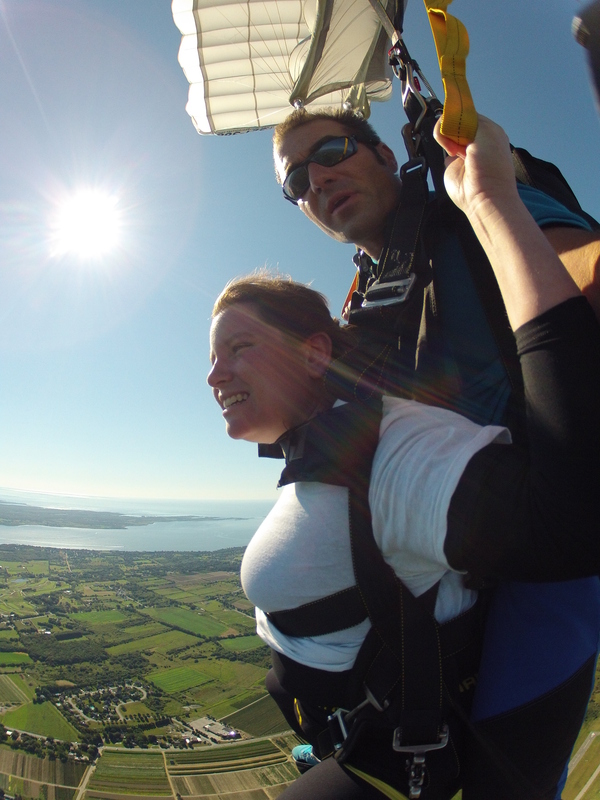 I’m much calmer than I was the first time I went skydiving. 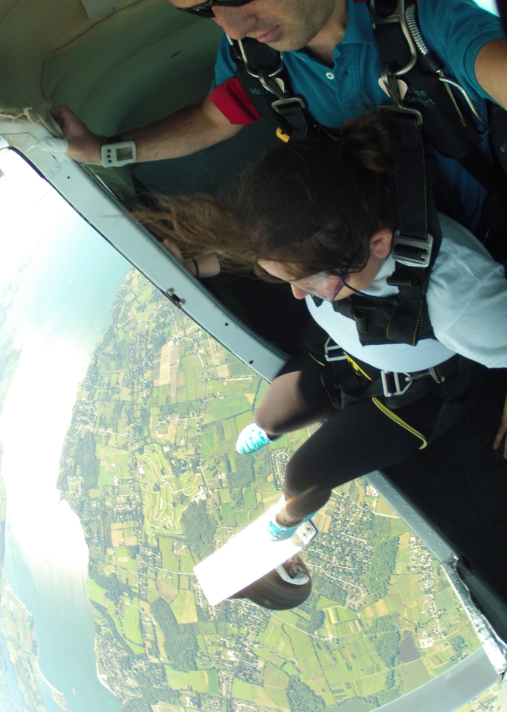 I wasn’t scared when I went the first time, but I can remember my adrenaline rushing, I can remember just wanting so badly to jump out of the airplane for such a free feeling. And I can remember it all happening so fast that I got sick on my own adrenaline. This, right now, is a different experience. I feel the plane leave the ground and I look out the window. The sky is void of any clouds and the water down below is reflecting a beautiful blue. The Newport Bridge stands out and I watch as the houses get smaller down below. This view is stunning. My instructor tells me we are getting close to jumping altitude and asks me to put on my goggles. I do. He tightens them. I take a look over to my friend Danny. He’s ready. I can tell. His tandem instructor pops open the door and they begin making their way toward the edge. Before I know it, Danny has disappeared out of the airplane, and now it’s my turn. Nicky, my instructor, and I move toward the edge of the plane. He tells me to go out a little further and I oblige, smile for the camera and then feel ourselves flip out of the airplane. Unlike my first jump, the world seems to slow down. Free fall feels less intense and I actually take in my surroundings. I’m present. 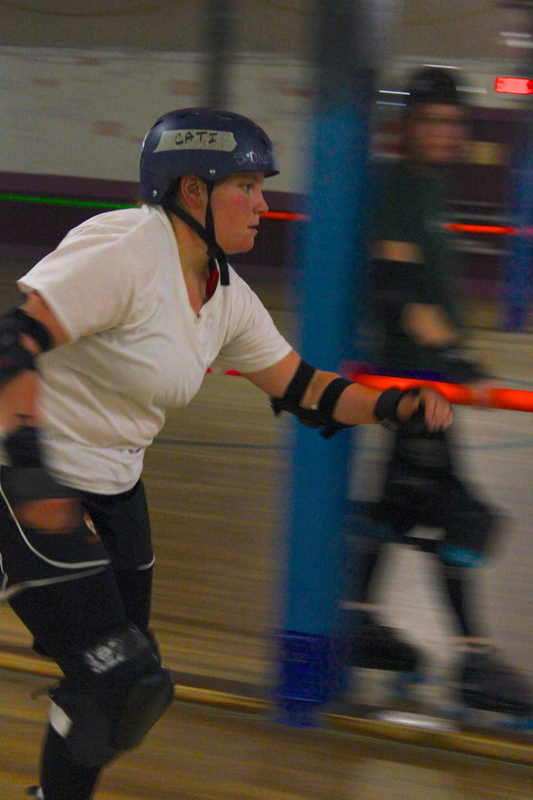 The adrenaline hasn’t taken over my body, and it’s kind of an incredible feeling. I’m breathing easy. 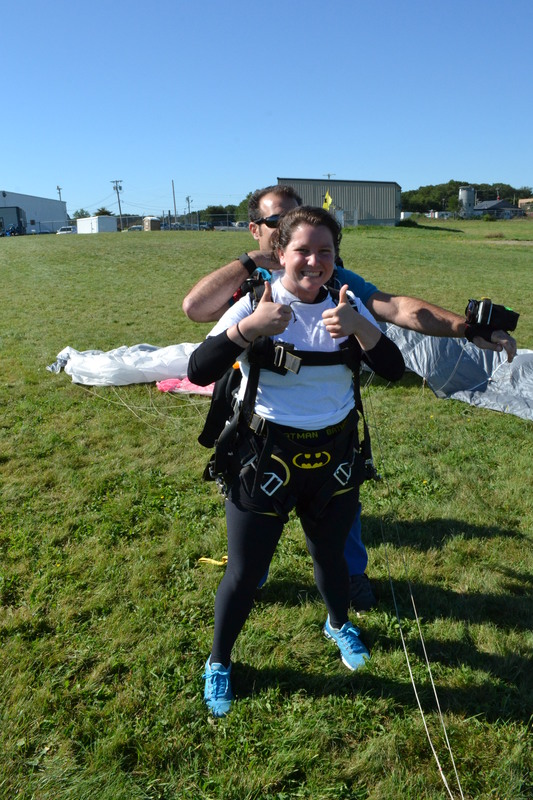 I’m pretty sure I didn’t breathe the first time I jumped out of an airplane. As we come in for landing, I giggle with joy and Nicky and I exchange high fives. And then I cross my fingers for Danny’s reaction. “I want to do it again,” he says. I laugh. I kind of do too. We run over to our friends in the spectator booth. I look at everyone and proudly exclaim, “I didn’t vomit this time!” They all laugh and we hug it out–excited about the feat we’ve just accomplished, the adventure we’ve just gone on, the chance we’ve just given ourselves to embrace life and the opportunities we are granted. My friends thank me again for setting it up–and I thank them for being up for it–and for getting me to be up for it again too–and for getting me excited all over about it again. That’s what life is about–getting excited, and about being open to trying new things and being open to trying things again and seeing how the experience differs. It’s about taking off or jumping (literally and metaphorically) and knowing that life’s accidental blessings will catch you. It’s about going on the adventures we’ve always said we wanted to. It’s about living the life we’ve always said we wanted to. So remember–beyond all the fears you feel when you set out to try something new or when you decide to take on a challenge, get excited—and embrace the opportunities. 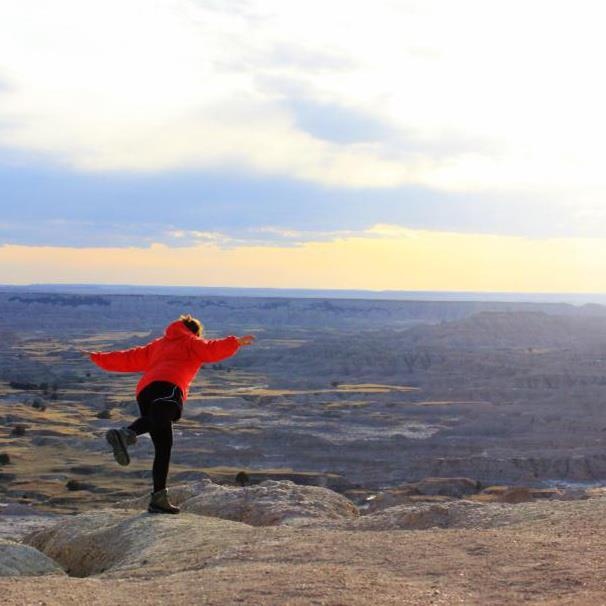 And most of all–when you do decide to jump (literally and or metaphorically), don’t forget to just enjoy the view. Posted in Adventure and tagged adventure, airplanes, excitement, fearless, friends, Hobbies, Jitters, joy, jumping, Life, me, nerves, skydiving, the hobby hoarder. Bookmark the permalink. 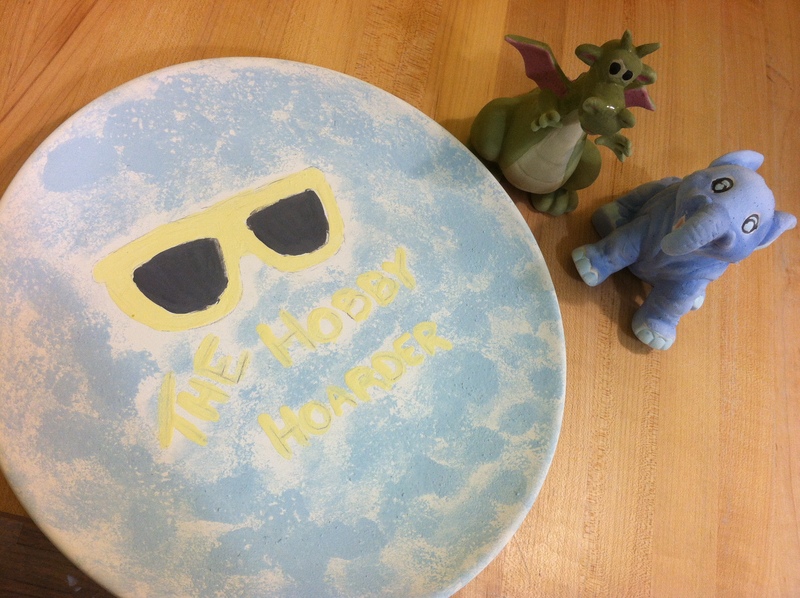 Later this week, I’ll be posting an update about my 99th hobby–an evening of paint your own pottery. And in less than two weeks I’ll be writing up the experience of trying 100 new things–in less than 100 weeks. This “project” started out as simply that–a project–a quest to try 52 new things in 52 weeks. But had I known how the challenge would expand my life, I may have set the hurdle of completing that many hobbies a little bit higher to begin with. Maybe I would have said 75 hobbies–or maybe I would have started out with 100 hobbies. But that’s the best part about challenges–we can’t predict what their outcome will be–what they will truly mean to us at the end–or what lessons they will present–or hardships–or triumphs. Would I tell EVERYONE that they should try 100 new things in 100 weeks–or less? No. But would I tell EVERYONE to challenge themselves? To set out on a goal–and to watch themselves exceed that goal? Absolutely. Maybe you don’t want to try 52 new things in 52 weeks–or 100 in less than 100 weeks–that’s COOL--It’s a kind of a crazy goal–(and crazy goals are good too), but maybe you want to try one new thing this month–or even just this year. Maybe you want to dedicate time to reading one new book every few weeks–or exercising three times a week as opposed to simply one or two. Maybe you want to train for that marathon you’ve always talked about. Or maybe you want to start that photography business or take a photo of the sunrise every morning. Maybe you want to travel the world–or meet every person who is still alive. Maybe you want to try a new dance class each day of the week or maybe you want to write the next best screenplay or enter that 48 Hour Film Project and win it. Maybe you want to produce a web series or write six new jokes for your stand up comedy gig. Maybe you want to take the baby steps toward jump starting your first business (a salon? a restaurant? a tour guide company?) Or maybe you want to just start saying yes a little bit more. GREAT. Whatever it is-Go Do It. Get out of your comfort zone and believe in yourself. This “project,” though gimmicky, maybe at first, was never about me trying 52 or 100 new things–it was about challenging myself and then inspiring you to want to challenge yourself, to refuse the word no–to break out of your shell–to believe that you could step up to the plate against Randy Johnson, and smash the ball out of the park. When it comes to the challenges you want to take on–full force–don’t doubt yourself. Never doubt yourself. Because the truth is–no one else is. And if for some reason they are, step up and prove them wrong because no matter WHAT they say–you are capable of anything. And I mean that. I mean that more than anything in the world. No matter what your challenge is–you are capable of exceeding your expectations of that challenge, and no matter what your dreams are–you are capable of achieving them. SURE sometimes your dreams may seem out of reach- or “too big” or too”impossible” to conquer. It may feel like EVERYTHING is working against you. BUT when the walls are closing in – when gravity is pulling you down – you’ve gotta fight to believe- to believe in all you’ve worked for – to believe in those dreams you’ve been reaching for so brilliantly- to believe in yourself – and to believe in the possible. Because it’s easy to say that anything is possible -to preach it to someone who is struggling or to internally tell yourself that “you can do anything”- but to BELIEVE it – and I mean to REALLY believe that anything is possible -well that – that takes a special person -that takes someone who will push those walls back – who will defy gravity and who will prove to you that indeed- ANYTHING is possible. So whether or not today is your day – or this week is your week – this month your month or this year your year – don’t get down. Do not let your dreams go. Keep your head up. Believe in the possible. Posted in Self Reflection and tagged believe, books, business, Challenges, competitions, dancing, Dreams, goals, Hobbies, lessons, Libby Segal, Life, Life lessons, passions, photography, possible, projects, pursue, reading, screenplays, the hobby hoarder, world. Bookmark the permalink.